“When we are born, we cry that we are come to this stage of fools”, laments King Lear as he lies on the brink of insanity, driven to madness by the scheming of his daughters. One of Shakespeare’s most desolate tragedies (to the extent that until 1838 the majority of performances offered an alternative happy ending), King Lear is concerned with betrayal, vanity, authority, and justice. All societal norms are upended in this play – a king becomes a madman, the blinded are those with the greatest sight, and the fool is the wisest character on the stage. 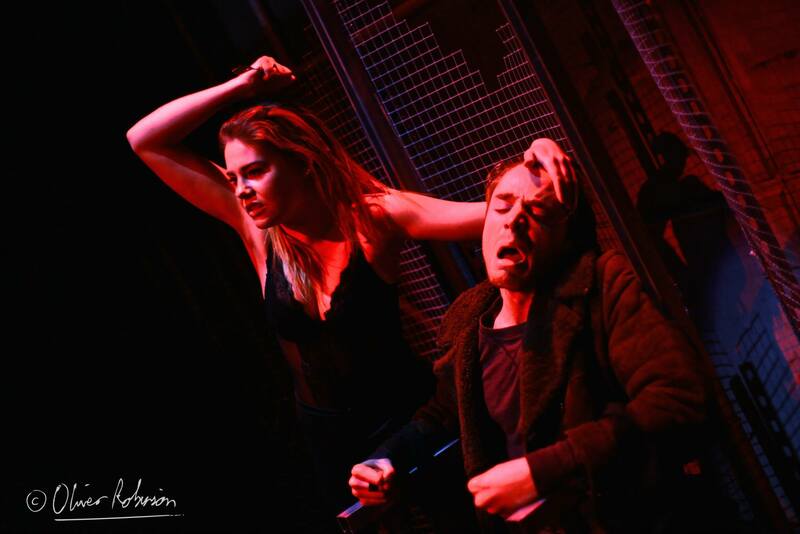 Oxford University Drama Society’s production, currently running at the Keble O’Reilly Theatre, accentuates these inversions in a post-apocalyptic industrial setting, using multimedia to confuse the boundary between sanity and lunacy. In an attempt to capture the horrific, hallucinatory world that Lear inhabits, the production aimed to ‘focus on sensory perception and immersion’. Drawing on Lear’s line “A man may see how this world goes with no eyes. Look with thine ears”, the staging tried to create this synaesthesiac experience with blinding lights, booming soundtrack, and use of film. By far the most successful aspect of the staging was the live recordings, filming some scenes as they were acted out on stage and projecting them on to the walls. In each instance it brought a new perspective to the on-stage drama; Edmund’s Act I monologue bore uncomfortable similarities to ransom videos posted on YouTube, subjecting Gloucester to the camera’s gaze after having his eyes gouged out put the audience in an ironically voyeuristic position, and seeing Lear’s reaction to his daughter’s death distant and magnified was an effective juxtaposition to the intimacy of the scene. At moments such as these when the production wholeheartedly committed to its premise of being a 21st-century, technologically immersive Lear, it was extraordinarily successful. However, much of the production seemed like a fairly traditional staging, with multimedia interludes between scenes rather than being fully integrated. 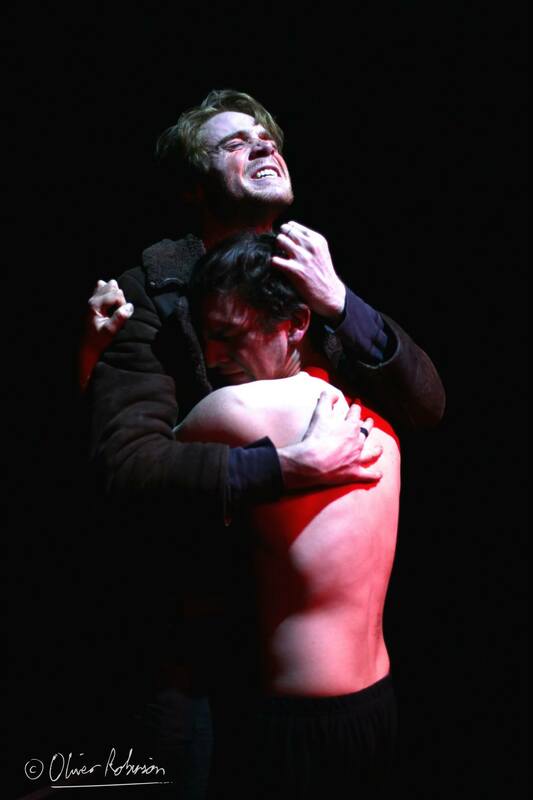 The underscoring to Gloucester’s speech at the close of Act I was superbly executed, as was the lighting in the scene when he meets his son Edgar but is unable to recognise him having lost his sight. Act III Scene 4, for example, could have benefitted from a more sensitive treatment in this vein, with more use made of sound and lighting, if not film. Throughout this scene where Lear truly beings his descent into madness, surrounded by his Fool, Kent, and Edgar disguised as Tom O’Bedlam, the staging gave little regard to the storm that is supposed to be raging across the heath. Besides the projection of a forest at the start of the play and the animal heads worn by the nameless characters, the nature imagery that proliferates in King Lear was largely downplayed in favour of a more industrial and mechanical aesthetic, so I was expecting a reworking of the heath scene in keeping with this. However, this scene largely revolved around the physicality of the actors in a pared back staging, which made it quite difficult to hear a lot of the dialogue and seemed like something of a missed opportunity. Isobel Jesper Jones was quite a tour de force as Regan, characterising her as brutal and overtly forceful in her sexuality. Seeing her take overt pleasure in gouging out Gloucester’s eyes (played by the similarly excellent Owen Mears) gave a deliciously sadistic edge to her portrayal, balanced by her seductive tone towards Lear in her first on-stage appearance. Regan, Gloucester, and Edgar (James Aldred) gave subtlety and nuance to their characters, an attribute unfortunately missing from Lear (James Hyde) and Goneril (Georgia Figgis). These are some of Shakespeare’s most complex characters, but Hyde’s Lear appeared mad from the outset, leaving him nowhere to go in terms of character development. Goneril seemed something of a caricature, with a lack of emotional range detracting from the malicious and manipulative nature of her actions. Oliver Skan and Will Stevens as Albany and Cornwall provided solid support to their female counterparts, with Skan coming into his own in his scenes with Aldred towards the close of the play. This is, for the most part, an imaginative and innovative staging of King Lear. The multimedia elements, where they were allowed to merge with the on-stage action, were superb throughout, so full credit must go to James Percival, Ed Horner, and Hendrik Ehlers as sound producer, lighting designer, and video designer respectively. I hope future performances continue to explore the possibilities that this production raises, going even further towards immersive and technologically integrated drama. Shakespeare’s plays are a continual resource for innovation and renewal, and this production offers glimpses of what a 21st century Lear could be capable of. ‘King Lear’ runs at the Keble O’Reilly Theatre until the 28th February; tickets can be booked here.